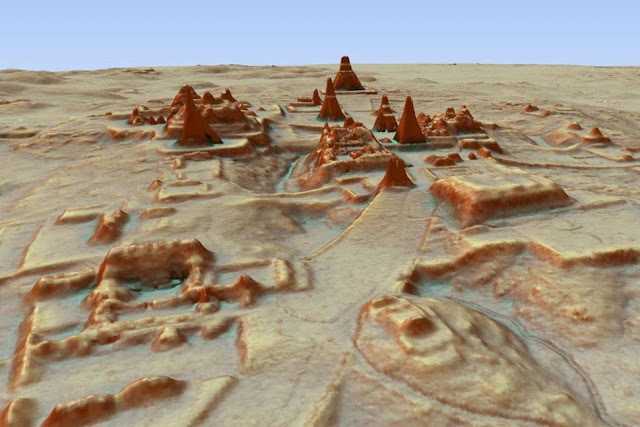 This digital 3D image provided by Guatemala's Mayan Heritage and Nature Foundation, PACUNAM, shows a depiction of the Mayan archaeological site at Tikal in Guatemala created using LiDAR aerial mapping technology. Researchers announced Thursday, Feb. 1, 2018, that using a high-tech aerial mapping technique they have found tens of thousands of previously undetected Mayan houses, buildings, defense works and roads in the dense jungle of Guatemala's Peten region, suggesting that millions more people lived there than previously thought. GUATEMALA CITY (AP) — Researchers using a high-tech aerial mapping technique have found tens of thousands of previously undetected Mayan houses, buildings, defense works and pyramids in the dense jungle of Guatemala's Peten region, suggesting that millions more people lived there than previously thought. 0 Response to "Scientists Find Massive Mayan Society Under Guatemala Jungle"